Google has already established the Nexus name – the lineup of smartphones that delivers the purest Android experience how the search engine giant wanted it in its device. However, several rumors and leaks from the past few days have begun to tell about the company dropping the name of its venerable smartphones. Fast forward to Google’s latest launch of handsets and it has, indeed, done it in favor of the new Pixel brand. Just recently, Google has announced its first smartphone that will carry the name. The Pixel, the standard sized smartphone, features a Qualcomm Snapdragon 821 chipset with a quad-core CPU comprised of two 2.15 GHz Kryo and two 1.6 GHz Kryo cores, Adreno 530 GPU, and 4GB of RAM. Storage also goes for 32GB and 128GB. It has a 5-inch AMOLED display with Full HD resolution, and its battery life is backed by a non-removable 2,770mAh. It will also run Android 7.1 Nougat out of the box. For photography, Google claims that the Pixel has the best smartphone camera ever. While that claim still has its time to be proven or debunked, it has the hardware and the benchmark test to back it up. It’s equipped with a 12.3MP shooter that features an f/2.0 aperture and 1.55 micron pixels, and it even scored 89 on its DxOMark Mobile score. 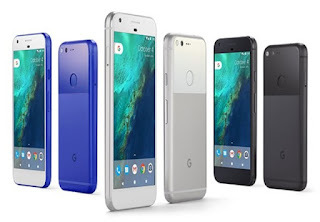 The standard-sized Pixel will be available starting October 13 for a street price of $649, and you can get them in three colors: Very Silver, Quite Black, and the US-exclusive Really Blue.